Luke always looks forward to Patrick’s tarts. Quite aside from being pretty tasty, it means he has the chance to call our beloved Moira from the Dorset Pastry Company. Moira makes arguably the best organic pastry in the country (maybe the world) and rumour has it a lot of top restaurants actually pretend it’s their own. We’re certain you wouldn’t do the same, but we recommend hiding the wrapping in your neighbour’s dustbin to make sure you don’t get busted! Preheat your oven to 200 degrees. Chop the green top and the very bottom from your leek. 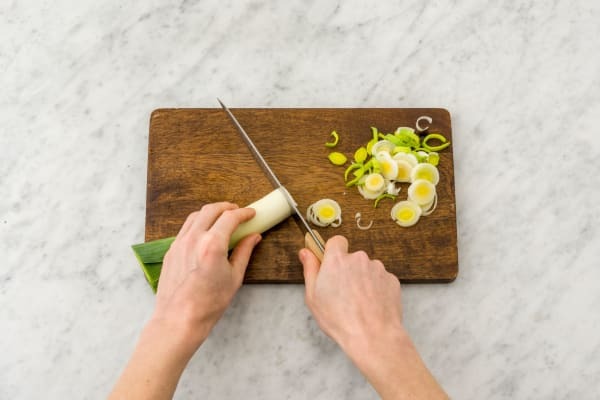 Slice the leek into very thin discs (1/2cm thick). Peel and chop the onion in half then very thinly slice half of it. 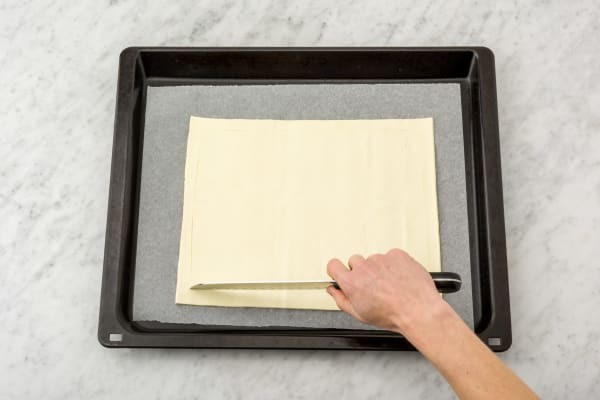 Unroll the pastry onto a lightly greased baking tray. 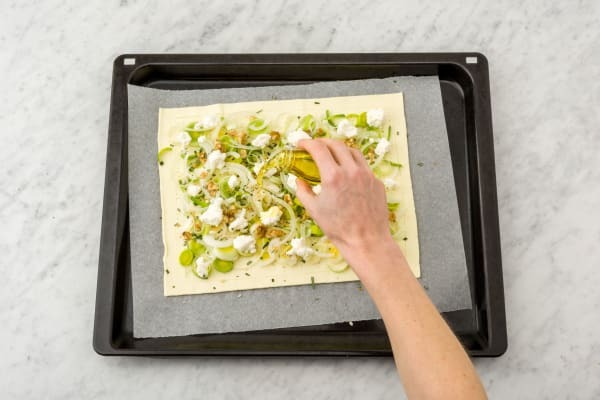 Using a kitchen knife, mark a border around the pastry, 1cm from the edge. Tip: Make sure you don’t cut the whole way through the pastry! 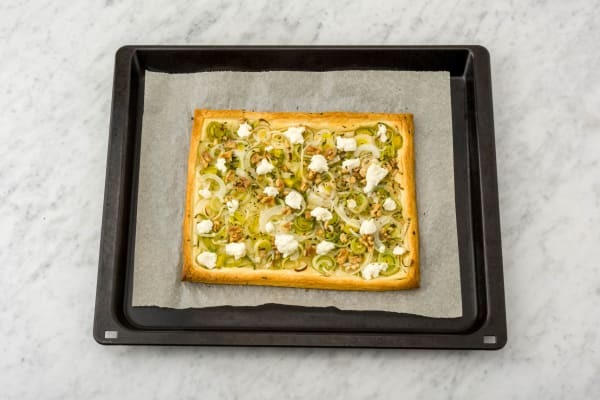 Scatter the leek, onion and walnuts over the pastry. Very finely chop the leaves of the rosemary and scatter these on top. Break up the goat’s cheese and evenly dot it across the top. Season with a good pinch of salt, pepper and drizzle on 1 tbsp of olive oil. Bake for 15-20 mins until the pastry has risen and is nice and golden. Tip: For a more golden finish, brush the 1cm pastry border with a little milk before you bake (if you have some). Dress from head to toe in black and sneak outside to hide the evidence. About 5 mins before your tart is ready, boil a pot of water for your beans. Add ¼ tsp of salt to the water and cook the beans for 3 mins. Drain and keep to the side. 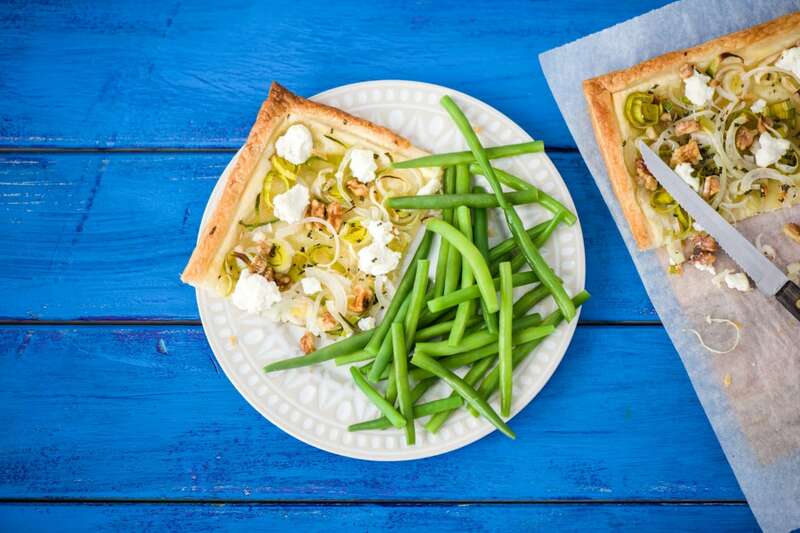 Serve the tart with the beans on the side.Tip:We like serving one large tart to cut at the table, but you can make mini ones if you like!